Tory Historian is a confirmed Anglospherist, as any reader, however cursory, of this blog will know. Therefore, discussions about conservatism in other parts of the Anglosphere are of particular joy, though discussions about conservatism in other parts of the world are also of interest. Firstly, Tory Historian would like to call the readers’ attention to an obituary by the great Claudio Véliz, author, among other things, of “The New World of the Gothic Fox – Culture and Economy in English and Spanish America” and of a superlative article in Quadrant that compares Gough Whitlam with General Perón, which explains why the wrecking of Argentina’s economic and political structure was not replicated in Australia. The obituary is that of William F. Buckley, whose death was noted on this blog as well. The whole piece is worth reading but of particular interest are the last couple of paragraphs. Of course, Bill Buckley could have penned this if Edmund Burke had not done it before him. William F. Buckley Jr was a Burke for our times. An interesting thought that Buckley was a Burke for our times. As we have pointed out on the blog, it is not at all clear that his influence has been at all strong on this side of the Pond. That may change in the future as, possibly, conservatism here changes and becomes more muscular, stronger minded and more certain of its basic principles. April 25 is Anzac Day, something all Anglospherists should remember. Unfortunately, for one reason or another, Tory Historian did not get round to posting this till after the celebrations finished in the countries concerned, though it is still Friday in western Australia though only just. 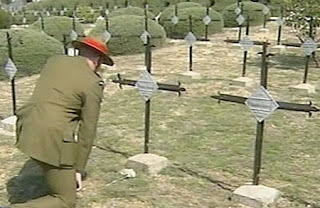 Nevertheless, we must not forget the role of the Anzacs in the two world wars and subsequent battles. They have even forgiven Britain for her behaviour in the seventies when Australia's and New Zealand's economies were ruthlessly undermined to get us into the Common Market. At least, we all hope they have forgiven us. This is not a topic that is often covered on this blog but Tory Historian feels strongly (as do all historians) that there is a tendency around to forget that some things we experience have happened before. A look at the BBC On This Day website will remind us that today is the anniversary of the massive IRA bomb in the City that devastated a large section of it, killing one person and injuring more than 40. We hear a lot from the anti-terrorist squad in the police and elsewhere that it is very difficult to deal with the people who are threatening us now because they are not like the IRA in their intentions or structural set-up. Indeed, not, but then the IRA was quite unusual in both. They had a definite aim and they were organized like the army they thought themselves to be. Other terrorist organizations in the seventies were very different, much nearer to the ones around now with many of them trained by the same people. Today is also the anniversary of the explosion in the West German embassy in Stockholm where three people were killed before and during it. Many were injured. The embassy's staff had been taken hostage by off-shoots of the Baader-Meinhof gang, 26 of whose members were at this time imprisoned and awaiting trial. The demands for their release were not met by the West German government who had, in fact, been humiliated by this band of terrorists before. The result was the killing of two attaches and the explosion. Eventually, members of the Baader-Meinhof gang were imprisoned and many of them committed suicide in gaol. There were so many of such gangs at the time. It would pay people to study their operation and how they were dealt with, what were the successes and failures. Above all, it is worth recalling that nihilistic, destructive, apparently aimless because the aims are so general terrorist groups are not new. It's jsut the IRA is not one of them. Tory Historian is finding it very difficult to understand why politicians, the media and the educational establishment should suddenly start fussing about St George’s Day, when it has been little more than a source of gentle entertainment in a very typical English way in the past. Some American bloggers are incensed that parades that have never existed before should now be cancelled not to provoke Muslim attacks. Muslims in Bradford are saying that they don’t really care and a nice parade would be just the ticket to cheer everyone up. Radio 3 is playing English music, which is a good idea, though less well known pieces would be an even better idea but one cannot help asking why the BBC should suddenly decide to become involved with St George. Politicians are sending round e-mails with St George’s flag, which must be the ultimate insult for that unfortunate saint. A busy man with many interests, clearly. However, the really important aspect of April 23, as readers of this blog will realize is that it is both the birthday and death day of William Shakespeare (1564 – 1616). Once again, Tory Historian is not travelling physically, but mentally. Reading matter for today (and the previous week or so) is Sam Tanenhous’s biography of one of the most important and enigmatic characters of the twentieth century, Whittaker Chambers. The book that was published in the United States in 1998 finally made its way to this country last year, complete with an introduction by Mr Tanenhous that invokes some spurious parallels between events of the forties and the present. The introduction proves that Mr Tanenhous learnt nothing from his research into Chambers’s life. One also wonders why it had to be retitled for the British reader. Instead of “Whittaker Chambers: A Biography”, it is now called “An Un-American Life: The Case of Whittaker Chambers”. Why “the case”? Do we in this country still believe that there is any doubt as to who spoke the truth in the famous Hiss-Chambers case? Or do we still credit those fraudulent charlatans who came up with ridiculous psychological explanations for Chambers’s behaviour that he explained very cogently? Reading the biography naturally led Tory Historian back to “Witness”, that most elegiac of memoirs and discussions of the real twentieth century and a book that is indispensable reading for all who want to understand American conservatism, so much more sinewy than our own, “Odyssey of a friend”, Chambers’s letters to Bill Buckley, published by the latter in 1969. Whittaker Chambers’s influence on Buckley and through him on the American conservative movement cannot be overestimated. This is not to say that Buckley did not have strongly held views, which he could probably argue through much better than Chambers could. There were many disagreements between the two but they shared an almost apocalyptic vision of the struggle they felt they had to wage with Buckley, the optimist, often out in front gleefully attacking everyone in sight. Chambers was a pessimist as all those who served the Communist cause well until they became so disillusioned that they broke their lives to escape thraldom. Other examples of this trend are Arthur Koestler, Ignazio Silone and Manés Sperber. The leading British anti-Communists had not been so strongly involved. Their opposition was more intellectual, less apocalyptic. The battles of the late forties and early fifties; HUAC and the Senatorial hearings; the revelations of the widespread Communist conspiracy (since then proved by Soviet documents); and, most of all, the Hiss-Chambers case have all provided American conservatives with a toughness that has since weathered and triumphed over the set-backs of the sixties and seventies. The future cannot be predicted but my guess is that Whittaker Chambers would have sounded Cassandra-like warnings during the celebrations of the fall of the Berlin Wall and would not have been surprised by the battles we have to fight now. No, this is not Tory Historian reporting from abroad, at least not physically so, but Tory Historian writing about conservative thinking in other countries’ history. Among these, possibly the most interesting is the case of Russia and its conservative thinkers, who have ranged from extreme theocrats to liberal conservatives like the legislator Mikhail Speransky (1772 – 1839) or the historian Boris Chicherin (1828 – 1904). Both these gentlemen advocated as kind of rechsstaat for Russia. Their view was, and they were almost a century apart, that western-style liberal democracy was not appropriate for that country but the existing autocracy was undesirable. The aim was a structure that was not parliamentarian but in which the rulers were subject to the law of the land. As Professor Richard Pipes, the pre-eminent historian of Russia and the Soviet Union, said in a recent talk he gave at the GB-Russia Society, that structure has not yet been achieved in Russia and was still highly desirable. He did not think we would see it in the immediate future. Professor Pipes has maintained for some time that the West has a skewed idea of Russian intellectual development because it has concentrated on the liberals and the radicals – possibly a more glamorous cohort and one that has managed to install its views into Western consciousness since the 1870s. Most recently, this fascination turned up in Tom Stoppard’s brilliant and tragic trilogy, “The Coast of Utopia”. There is more, says Professor Pipes. In the West it is thought that Russia is a radical country. When I was at Harvard in 1948 we heard Isaiah Berlin lecture on Russian intellectual history; in time, Isaiah Berlin became a good friend of mine. Of course, his principal hero was Alexander Herzen, but others were Belinsky, Chernyshevsky and people like that. He never lectured on the conservatives, and now we have a new play by Tom Stoppard called “The Coast of Utopia” which deals entirely with these people. But these people had minimal influence on the course of Russian history; if they did, it was in a very negative way by frightening the government and causing it to repress. The course of Russian history for hundreds of years was determined by conservatives and there is virtually no one who deals with that subject, which is why I have made it my job to study Russian conservative thought and see how it influenced Russian thinking. 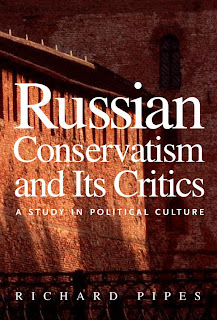 The fruit of all that endeavour is a fascinating book called “Russian Conservatism and its Critics”, published in 2006 and strongly recommended to all those interested in varieties of conservative thinking. You don’t have to approve of it. Tory Historian has not had much time recently to blog but this will be rectified from now on. And the first thing to be written about is the RSC’s production of “Henry V”, seen at the Roundhouse on Saturday. The RSC’s sequence of the Histories or Chronicles, from Richard to Richard, comes with high praise from two seasons in Stratford and the Roundhouse, nowadays a venue mostly for rock concerts, has been turned into a copy of the Courtyard Theatre. The tickets have been flying out of the box office. Tory Historian was intending to see the whole series in order in May but found that the “Henry V” of that week-end had sold out. So it had to be seen out of order, which does not matter so much for this play as it is a stand-alone one, despite the tiresome Chorus, who comes in at the end to mute the celebrations of victory and Henry’s marriage to the French Princes Katharine by reminding the audience that in “Henry VI” they will see all that our hero has achieved being frittered away and the country descending into chaos. If one compares the play with the glorious Olivier film it is the Chorus that makes it much duller. Sadly, he is there in the original and was largely cut out of the film. A tiresome theatrical business and one that is not entirely comprehensible. So far as Tory Historian recalls, “Henry V” is the only play in which Shakespeare used this convention. Otherwise, the play stands up well to the comparison, not least because of the acting. Geoffrey Streatfield, as Henry, is excellent. We may well be seeing one of the great Shakespearian actors of the generation here and one does not say that lightly. Streatfield’s Henry is always aware of how his father came by the crown, which has descended to him. He is reluctant to wear it, leaves it behind several times and when it is brought to him, shies away. When wooing Katharine he very deliberately takes it off and gives it to the lady-in-waiting to hold. This is a strong and heroic character that is, nevertheless, full of worry and doubt. The knowledge that he will die young and not fulfil his potential is so much more poignant. There is much more to say about the play and the comparisons one can make with that superb film but it will have to be left to another posting. Perhaps, as once before, it will be possible to draw together several strands through several pieces on this blog; and, perhaps, there will be contributions on the subject from our readers. Details of the next two CHG meetings have been confirmed. As a special inducement, there will be a new edition of the Conservative History Journal available by the June meeting. There is no need to be upset by the death of an 84 year old man who has achieved much in his life, was greatly respected by millions of people around the world and who has given great pleasure to many millions. For all of that Tory Historian was sad to hear a few days ago that the great Charlton Heston had entered into the last stages of Alzheimer's and even sadder to find this morning news of his death. Dirty Harry at Libertas gives a wonderful obituary so we need to add nothing more except to say that Heston was a true conservative - a believer in freedom and the constitution. He was also a man who was prepared to fight for what he believed in even if it threatened his career or made him a pariah in Hollywood. What a difference between that stand and that of people who prance around calling themselves courageous while repeating trendy slogans.